We receive numerous questions regarding law in general and our practice’s specific services. Below you’ll find a few of our most frequently asked questions and their answers. If you can’t find the answer to your question, please feel free to call us for a initial personal consultation. A Will for an estate over $100,000.00 is used to transfer a decedent's estate through a court supervised process called probate. There are fees and costs incurred during that process, which can be avoided through the use of a Living Trust. A trust is used to privately transfer a decedent's estate, outside of court, for substantially lower fees. My wife and I are divorcing, but we're not fighting. Is there any way we can complete our divorce easily? Yes. When the parties are in agreement on all of the issues between them, it is possible to obtain an uncontested divorce without a court hearing. Probate is the court supervised transfer of a decedent's estate. The process involves the filing of a Petition, noticed hearings, notifying creditors, and an Inventory and Appraisal to obtain an Order for Final Distribution to the beneficiaries or heirs. The process will usually take at least five or six months and may take substantially longer if the case has complications. What do I do if my spouse and I are fighting and we can't agree on the terms of our divorce? That is called a contested divorce. 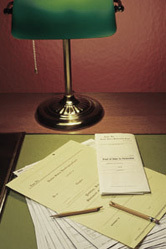 In a difficult situation it may be necessary to file an Order to Show Cause along with the Petition for Dissolution of Marriage, requesting that the court grant temporary custody and restraining orders prior to a full hearing on child custody, child support, spousal support, property control and restraining orders. Call Us Today For Your Initial Consultation!